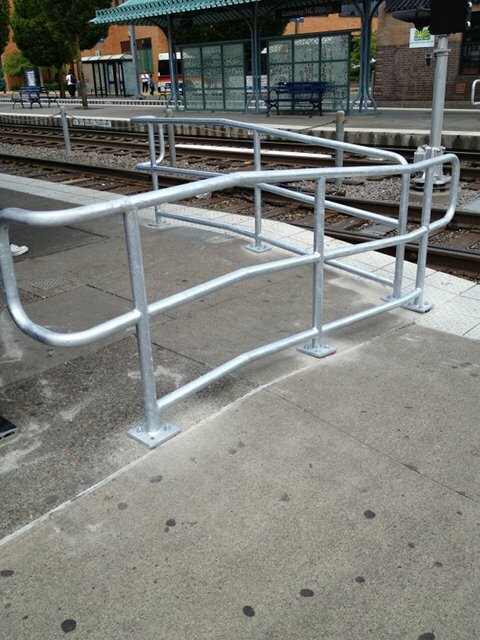 This entry was posted in general TriMet, safety and tagged accidents, light rail, max train, portland, prevention, public transit, public transportation, rail, railroad, safety, trains, trimet. Bookmark the permalink. I’m generally a safe person around MAX. But I did have what I consider to be a near miss a few years back. I was running late when I got to Elmonica. The eastbound train was arriving. I grabbed my things and started running. As I got to the crossing, I didn’t look east right away to see if a westbound train was coming. Something clicked in my mind, I looked east, and there was a train — not close enough that I wouldn’t have made it if I’d crossed, but close enough to potentially end up as a video — and close enough that I probably made the operator nervous. I stopped, I backed up a step, I looked at the operator, and I put my hands up a little to say “I see you, I’m stopped, I’m not crossing.” The westbound train pulled in safely and I caught the eastbound train. There was signage. There were safety bars. There were warnings. And yet I still didn’t notice them when I was running. “You can’t make anything idiot proof because idiots are so ingenious.” – Ron Burns. If someone wants to avoid the safety precautions, they will. If they’re not paying attention — running absentmindedly and on autopilot — it’s not going to matter how much safety equipment is installed. I understand your point about the word “pedestrian” on a service alert, but knowing it’s a trespasser doesn’t do anything for me as a commuter in the heat of the moment. The details will come out in the news. One time I was on an eastbound train at Millikan. We came to a sudden stop as we were pulling out. Turns out there was someone jumping out of the bushes next to the tracks. We ended up stopped for about 10 minutes. But if I saw a service alert seeing that there was “an incident” with MAX and “a trespasser” doesn’t make my train start running any faster. The compiler of that list is known for making bold claims that end up like those trespassers when dissected. So at least don’t get too worked up over him. And that turned out to be a really good video with the train shadow showing. I think the second-to-last frame with the other woman in the shadow is especially showing. I can never ride the train anymore without seeing somebody do something stupid. It stresses me out as a passenger so I can’t even imagine what the operators are feeling. Recently, there were a bunch of supervisors/inspectors doing code enforcement at the Old Town/Chinatown station. They were crossing the tracks mid-platform instead of using the crosswalks at either end (or getting permission to enter the right-of-way). I asked whether they could enforce code there since I think that’s considered non-TriMet city sidewalk but I should have asked if they thought they were setting a bad example in their crossing. Most of the time when I’m on the Max it’s usually during some sort of an event like the Tree Lighting or something. It’s during those times I notice some of the most offensive displays of human … obliviousness(?) 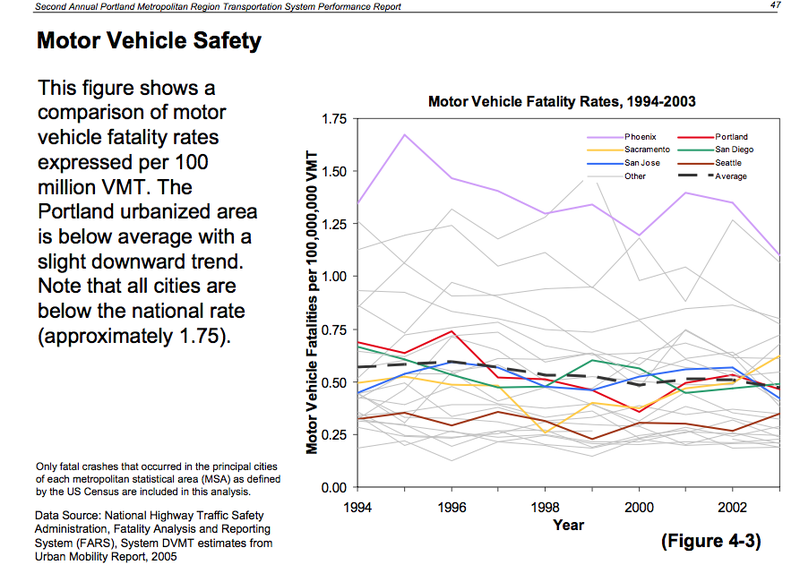 … in the face of large moving vehicles that don’t stop very quickly. The assumption is made that if the train’s moving slowly, it won’t take much effort to stop; these people obviously have never seen cruise ships in action. My favorite demographic is still the mother with a young child in a stroller, where the commonly held belief among them is that their child has magical inertial-dampening properties that make trains stop instantly. I don’t think any amount of rumble strips, gates, bars, signs, or PSAs will do much to keep that from happening. I REALLY REALLY REALLY want to know what that suicide note said. They NEVER EVER release the contents of those suicide notes. And I wanna know WHY! And I would also like to see a biography of people that step in front of trains (or buses) to kill themselves. I for one am interested in the lives of these people. But alas, our media does not work, it only tells the public what it wants to tell the public. The rest of the mystery remains a secret. I’m betting it isn’t the media, it is likely a law/respect for the families and living individuals that are left alive to deal with the pain. Privacy, etc. They report on everything else, all kinds of crazy stories about crazy people without respect for their privacy. If people commit an intentional act of public suicide It is my bet that they want the world to know something. 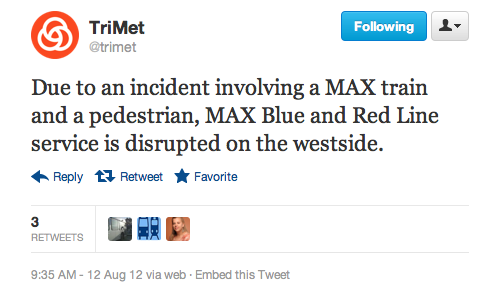 I ride max enough to pretty much be wherever a incident happens. But every time I see someone, even a pigeon get infront of a moving train, I cringe! A couple of times I helped a blind man and a deaf lady downtown not get hit. But unless you are incapable of noticing a giant two car train blowing its horn that’s coming directly at you because you wanted to trespass, you will sadly become the product of darwin’s evolutionary theory. I feel bad they had to kill themselves but it’s a shame two operators have to deal with that, but at least they can get counseling and help afterwords. But when I have children I will teach them two things, the three left steps of not getting run over, and more importantly, STOP WHAT YOUR DOING, STOP BEING STUPID AND LOOK BOTH WAYS! btw, not commenting on suicides and other such nonsense. Accidents happen sometimes and it is sad when people lose their lives because of a lack of attention. Literally happens to hundreds of thousands a year. However my main point of commenting, I just wanted to say absolutely great write up. Lots of good information and thought behind it all. I have lost count of the multitude of morons seen walking alongside the tracks or standing between tracks in the middle of the street. The dummies who intentionally cross the barricade separating the two sets of tracks on Interstate Avenue really piss me off. Blatant disregard for safety in lieu of convenience. Seems as if the transit police are never around to catch trespassing idiots.